After being called to investigate a possible case of spontaneous combustion, arson investigator Anya Kalinczyk is drawn into a supernatural case surrounding a charity run by a magic enshrouded woman named Hope Solomon. It is during this inquiry her familiar Sparky lays eggs and becomes a weak spot through which Anya’s enemies can strike at her. Soon Anya will discover nothing is safe. Nothing is as it appears. And nothing will ever be the same. 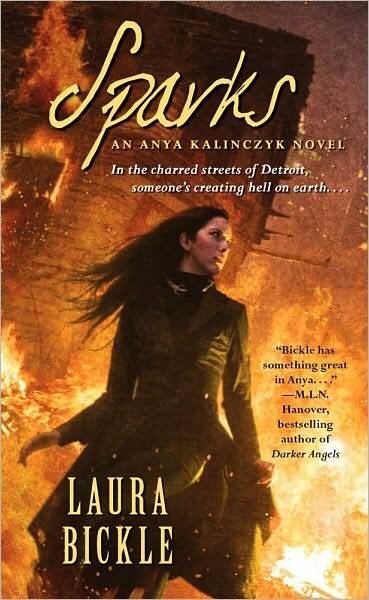 “Sparks,” by Laura Bickle is book two in the urban fantasy series about Anya Kalinczyk a psychic medium/fire investigator who works to protect the dark city of Detroit. The first book in the series “Embers,” introduced us to Anya’s ability to devour ghosts. By the end of the book Anya had learned the name for her ability, but didn’t know why she of all people had the ability to eat ghosts. “Sparks,” begins six months later when Anya’s boss dumps a supernatural arson case in her lap. During her investigation she is forced to reevaluate past decisions and forgive herself for her role in her mother’s death. A little of the mystery surrounding Anya’s parentage is brought up, but it feels like a teaser for the next book. Unfortunately, I couldn’t find a title or release date for it. On to romance and Anya. I never like Anya’s love/lust interest, Brian. Brian (and Anya) works with the paranormal group Detroit Area Ghost Researchers, or DAGR. However he also has a secret technical side job working for the government. His research shows a side of him Anya never saw before and I don’t think it will be long before Anya figures out he is not the man for her. I’ll admit having Brian is an excellent way to show not all heroines falling for the “man of their dreams” will be happy. When I reviewed the first book I talked about Sparky, Anya’s elemental familiar. I really enjoyed him and that feeling still existed in “Sparks.” Sparky is a male, but he was able to lay eggs. This is commented upon by Anya and her mentor Ciro. Ciro explains the plausibility of the situation by telling Anya Sparky became what she needed him to be. He is an asexual creature and gender is “meaningless.” I think it is a rather ingenious way to make the situation believable. The eggs play an important role in moving the story along, but their biggest contribution is in how they helped Anya grow as an individual. What I really think: I was entertained by reading “Sparks” but I wasn’t enthralled until chapters 18 through 20. As I neared the end of the book you couldn’t pry it from my hands. Add to that my love for the way Bickle contrasted people’s appearance in the spiritual world to that of reality, and you got a pleasantly dark book. Despite all the positive aspects of “Sparks” I put it down often. The story just couldn’t hold my attention at times. Read a sample chapter at Juno. Thanks so much for taking the time to read and review SPARKS. I’m so glad that you enjoyed it! Any time Ms. Bickle. Thanks for taking the time to pop by Scooper Speaks.